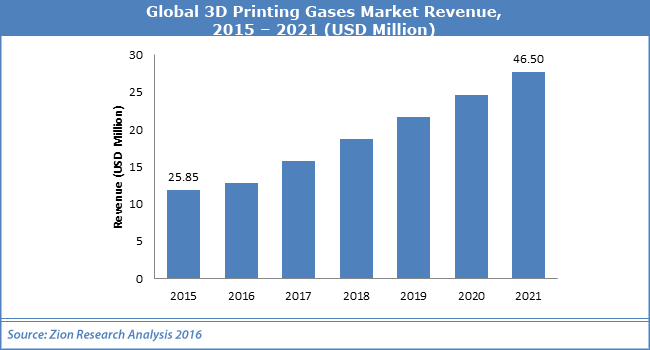 The overall Global 3D printing gases market is likely to demonstrate a lucrative growth, owing to tough competition witnessed among the major industry participants across the market, claims a research report by Zion Market Research. The key global players of 3D printing gases market are BASF SE, Air Liquide S.A., Messer Group, Airgas Inc., and The Linde Group. These industry mammoths have been adopting business growth strategies for growth of their business, such as high R&D investments, M&A, product innovations, and geographical expansions. Analysts predict that the firms will continue to implement these same strategies in the near future in order to gain a competitive advantage.